Mannoproteins are major components of the cell wall of yeasts. Their presence in wine performs a series of beneficial effects such as the increase of tartaric stability, the improvement of body and volume sensation, the stabilization of the aromatic fraction or the agglomeration of thermolabile proteins facilitating clarification. Generally, wines are enriched in mannoproteins during the autolysis of yeasts over aging on lees. Autolysis is characterized by being a very slow process so it takes several months to get sufficient levels of mannoproteins. Pulsed electric fields (PEF) is a technology that causes an increase in the permeability of the cytoplasmic membrane of cells (electroporation). The release of mannoproteins during autolysis requires the degradation of the cytoplasmic membrane of the yeast so that proteolytic and glycolytic enzymes, located in the cytoplasm, degrade the cell wall. Therefore, the objective of this research was to verify if the treatment of the lees by PEAV accelerated the release of mannoproteins during the aging on lees of a Chardonnay wine. 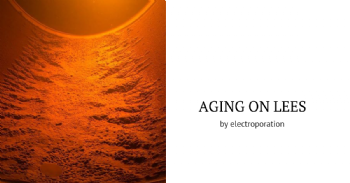 The results obtained show the potential of the PEF technology to reduce costs and risks of microbiological alteration in the process of aging on lees. VIDEO SEMINAR ENOFORUM 2018: An interesting alternative to the SO2 is the use of bioprotective microorganisms that prevent the development of unwanted microorganisms.